What happened to equal enforcement of the laws? Knoxville Police Department does not offer equal enforcement of the Laws. Now let me say I do back the blue but doing this I can be totally impartial. I do understand the stress that Police Officers go through and not all are like that and misuse their authority I only account for those to be less than 5%. I do put the Blame where it lays on the upper echelon, the Knoxville City Council and The City of Knoxville Mayors office. Today, I am only discussing 3 laws that’s on the books and either not enforced or enforced in one segment of the population verses other area of the city. The first is the No Plate Light Ordinance. This is an asinine law that is a catch all in the inner city. 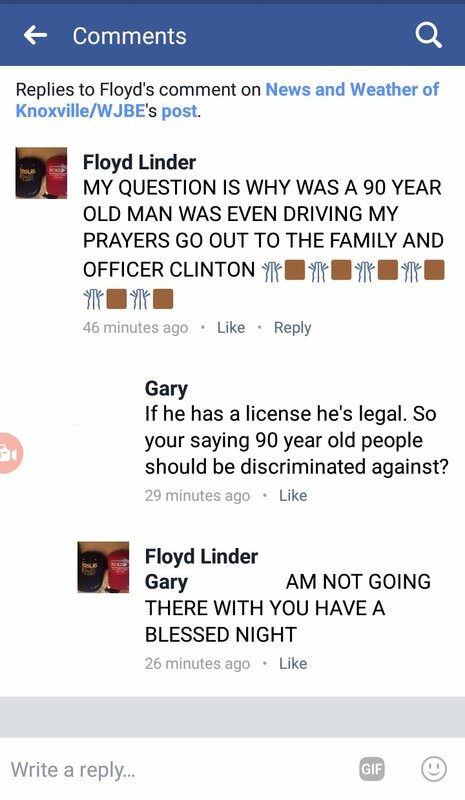 So minisqual that the State laws don’t even have it. It is used as PC to perform a traffic stop to catch a more serious Traffic Violation. They (Knoxville Police Department) uses this ordinance to target the inner city while you go into other areas of the City and this is not as enforced as it is in the inner city. The Second is because we have the 4th of July coming up and the City of Knoxville has an Ordinance to ban the use of Fireworks and offers a fine. In 17 years of living here I have never seen anyone cited nor have I seen Knoxville Police Department even respond to issues of Fireworks in the Inner City. They might respond to them in other parts of the City. So, why is this law even on the books if they aren’t even going to enforce it? Why not make it legal and just let it go as that. I suggest the Knoxville City Council and The Knoxville Mayors office to take a look at these matters and pull all citations issued the past 10 years and look at the statistics and see what laws are being upheld equally, which ones are targets for a reason to perform a traffic stop and which ones need to be done away with. Can any member of the City council tell me the last time they visited the City Ordinance? 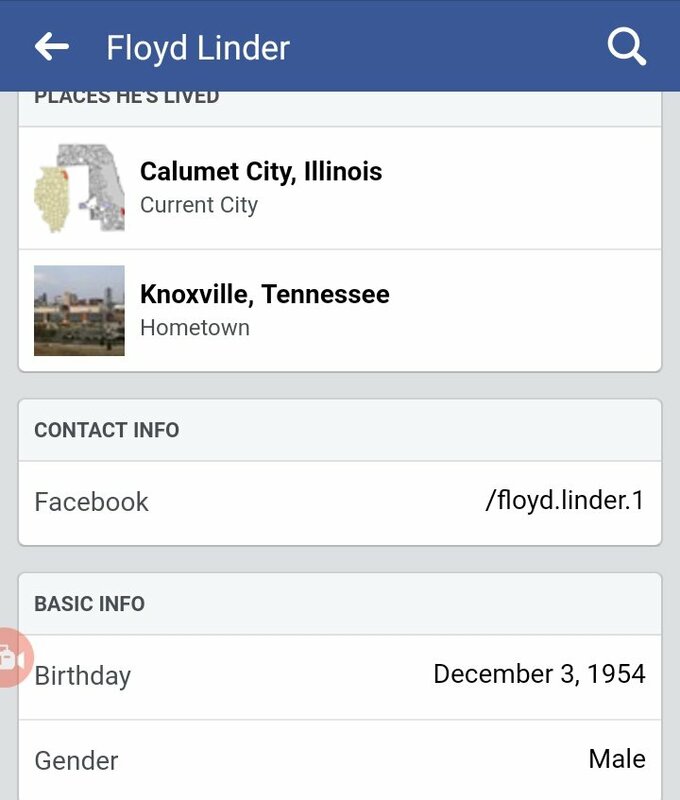 Author livewithgaryPosted on July 3, 2017 Categories city of KnoxvilleTags city, council, department, Knoxville, laws, mayor, of, ordinances, police, Tennessee, TN, unfairLeave a comment on What happened to equal enforcement of the laws? 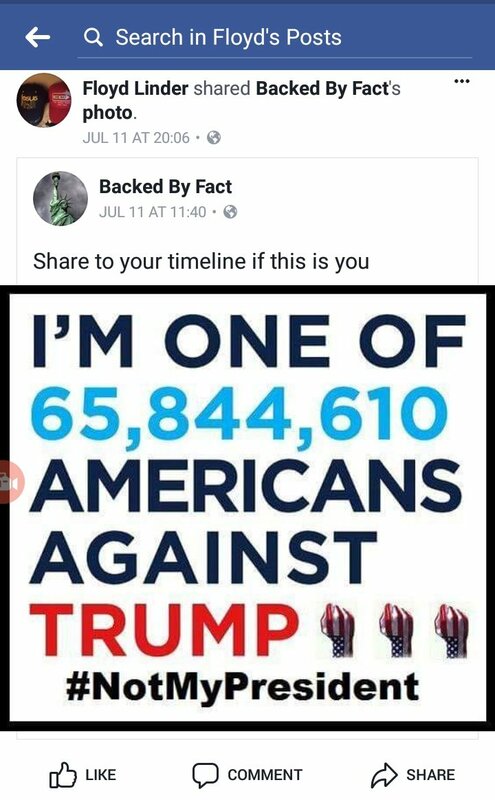 Well as anyone that knows me knows that I am anti-racism, anti-drugs and Pro-gun but, this pot head takes thing’s too far. Let’s start providing proof he is a pot head. As you can see his own words says he is. 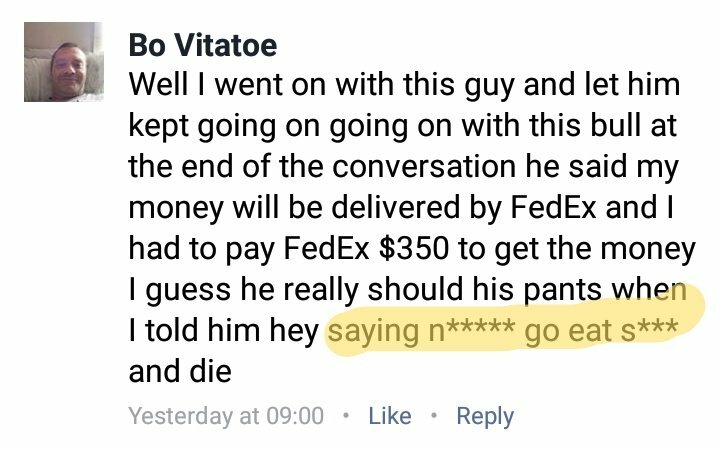 If you look at the highlighted portion he drops the N word when he is talking about Nigerian Scammers. 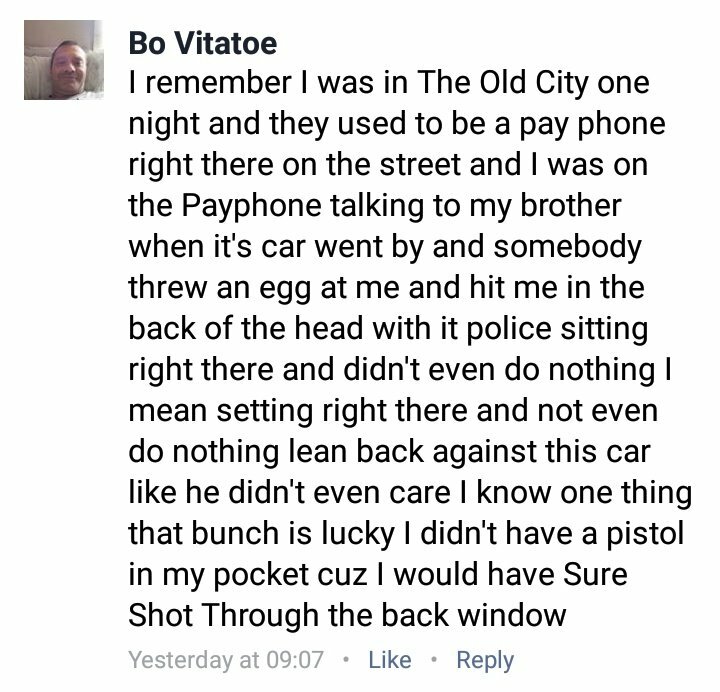 Now look at this excerpt where he talks about getting hit in the head with an egg and talks about shooting them. 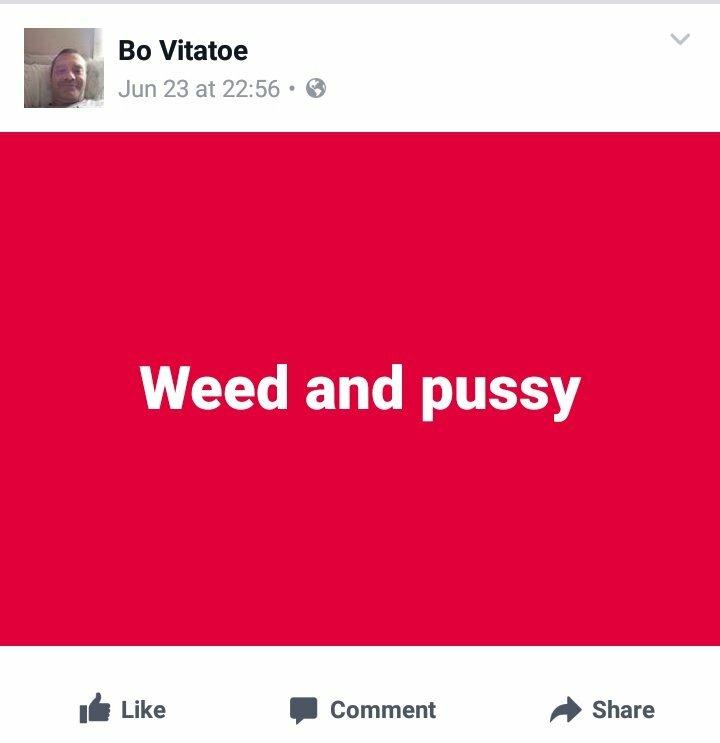 I am pro gun but anti stupidity and ladies and Gentlemen Bo Vitatoe is stupid. Let me explain the old city to you. The old City is an area in Knoxville just east of downtown that is strewn with bars and the Greyhound bus station. So the odds this douchebag was drunk and so I assume the egg throwers were too. Now to shoot someone for throwing eggs is pretty stupid. What’s your thoughts as always leave your comments.